Some businesses in south-west England say they are being crippled by the Brittany Ferries strike. About 3,000 lorries use the ferries every week between Portsmouth and Plymouth and France and Spain. But ferries have been suspended indefinitely because of a strike by French crew members unhappy with working terms and conditions. A Cornwall shellfish firm with three trucks stranded in France said the strike was an "absolute nightmare". Passengers and freight are being redirected to the Calais-Dover route. But driving to Calais from Roscoff in Brittany, a journey of 424 miles (682km), would be almost prohibitive because of the petrol cost, said Paul Blewett, managing director of Camel Fish. 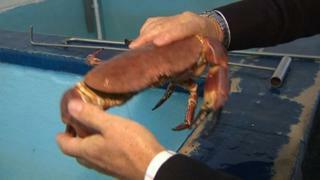 "We rely on Europe very heavily for consumption of shellfish," he said. "We couldn't sell it all in this country. "And Brittany Ferries are the only ferry company in the South West. "We can go to Dover but it's a long way and the mileage is fantastic. "If we have to do that we will, but we will have to drop the price of the shellfish and that's going to make it unviable for the fishing boats." He said shellfish could be kept for only three days, so waiting with loads of shellfish at Plymouth or Portsmouth was not an option. "They are holding us to ransom," he said. "We have three trucks in Roscoff waiting to come back to try to load shellfish to go out again next week but we have no idea what the state of play is. "We are frightened to load anything at the moment." Fisherman Jeremy Brown from Port Isaac said: "If we are catching fish we need to shift them regularly, we can't store them for too long. "We work hard during the summer and any hiccup is not good. We have enough trouble with the weather." Brittany Ferries said it had no choice but to cancel its crossings and tie up its ferries in France and it has apologised to customers for the disruption. The company is trying to reduce costs following three years of losses. Negotiations are still taking place in Roscoff between managers and French unions, but no ferry bookings are being taken up to Thursday this week.